With just 12 days until Christmas, I figured it would be a good idea to write the “Career Girl Holiday Wish List” – for everyone who’s shopping for that special career girl in your life, here are some of what we consider here at Career Girl Blogs to be the perfect gifts. Save her iPad from its boring black cover with the Kate Spade “Journal” iPad Cover. For the record, it’s the one I carry thanks to my wonderful husband. $85 at www.katespade.com. I’ve recently fallen in love with this amazing new company, Lo & Sons. In the last month (confession) I’ve purchased their O.M.G. bag, their Travel Tote (T.T) and the Mott cross body bag. I’m in looooove. The story of the company is inspiring. Two sons left their high powered jobs to help their mother start her dream business – to make bags both stylish and utilitarian for the frequent business traveler. But even if you’re not a frequent flyer, these bags are for you! I carry one every day for my odds-and-ends, laptop, iPad, and more. The bag pictured above is their largest, the O.G. – all of which can be found at www.loandsons.com. Another from Kate Spade (I love her!) I bought this bracelet the day it came out at Nordstrom. 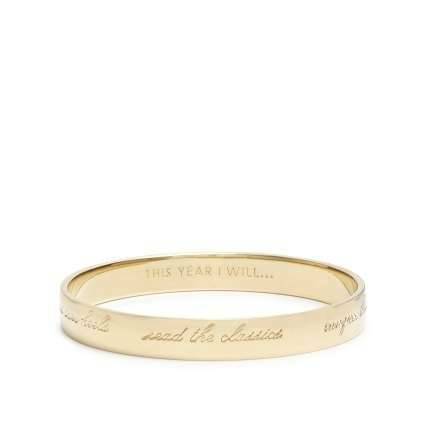 It’s her “Thi is the Year” bracelet. The inside is inscribed with “This is the Year” and the outside has inspiring inscriptions for things to seize in the upcoming year. Things like, “Play your cards right” and “Make sparks fly” adorn your wrist with hope for the new year. Also available at www.katespade.com. I subscribe wholeheartedly (and somewhat controversially here in Chicago) to the fact that Uggs are not shoes. At least not the traditional Uggs. They are not to be worn outside or in public. So this year, I’ve asked my husband to buy me, for our new home with wood floors and somewhat of a draft, Ugg slippers. Slippers that, for the record, will NEVER be worn outside. But every career girl needs to put her feet up and relax at the end of the day. And her feet, well, they should be warm! Found at www.nordstrom.com.